The 2007 honda cr v electric vehicle qualifies for a federal tax credit of up to $7,500, effectively reducing the net base price. When the Honda CR-V first appeared in 1997, the SUV landscape had a far different look than it does today. Then, the market was thinly populated with four-wheel-drive wagon/SUV hybrids like the CR-V, and the new Honda was the class of a very small class. These days, steep and steady gas prices have chased many drivers out of their large sport utilities, downsizing in the hopes of economizing. As a result, the roads are thick with crossovers, and the third-generation CR-V rolls onto a far more competitive playing field. There's little pizzazz in practical. If you chafe in sensible shoes, a compact crossover may not be the right fit for you. The CR-V's body and chassis designs are new for 2007. The list of standard safety equipment is expanded on all trim levels, the engine gains 10 horsepower (now 166), and is linked to a newly-standard, five-speed automatic transmission. On the road, the CR-V has a well-integrated feel. The four-cylinder engine is right-sized for daily driving duties and the automatic transmission shifts smoothly. The only interruption to the quiet inside the cabin is some buzziness from the engine in high-demand situations, such as when the transmission kicks down to a lower gear for passing. Beyond that, there's not much road noise and little wind noise, even when the moonroof (standard on EX and EX-L) is open. The CR-V has a cushioned ride that belies its size. Handling is stable and predictable. Visibility is good in all directions, even to the rear. That's rare among SUVs, and credit goes to the relocation of the spare tire and the redesign of the rear-seat headrests. The four-wheel-drive system is automatic, requiring no input from the driver. The system shifts up to 70 percent of available torque from front to rear wheels as needed for improved traction. A compact car with a big-car ride, the CR-V has a composed feel, easily rolling over rough roads without ruffling the passengers. Right-sized, real-world dimensions and a highly adaptable interior are two reasons why the CR-V is Honda's biggest seller worldwide. Like most people, the CR-V's proportions have been rearranged a bit by the passing of the years. Unlike most people, the shift here is mostly positive. The latest version is a little shorter (3.1 inches), a little wider (1.4 inches) and it's put on a few pounds (88). The lessening in length is due to the removal of the SUV-influenced outboard tire carrier: The spare is now located beneath the cargo area. The width boost corresponds to an increase in hip room, with wider, comfortably bolstered seats. Front seats have enough travel to accommodate the long of leg, and all trim levels benefit from fold-down, inside armrests. Rear-seat legroom has been reduced by about an inch in the latest generation models. You can fit six footers front and rear simultaneously, though it's a skosh tighter in back now than it was previously. The new, dual-dial dash is an easy read. Controls and switchgear are all within arm's reach and simple to operate. Inside storage areas abound. Like its predecessors, the new CR-V's defining feature is a highly flexible floor plan. Split rear seats fold easily and tumble forward. Doing so increases cargo capacity from a generous minimum of 35.7 cubic feet to a maximum of 72.9 cubic feet. Lift-over height in back is low. Second-row seats also recline slightly and the headrests have been redesigned for a visibility-enhancing low profile when not in use. Rear-seat travel is adjustable fore and aft. This allows you to pull row two closer to row one, shortening the trip for those occasions when the answer to the question, "Do I have to come back there?" is, "yes." The first two generations of the CR-V made their mark by combining exceptional utility with enviable reliability. They were high function, but low fashion. This time around, Honda aims to lay claim to that portion of the new buyers flocking to this segment who are style conscious. Toward that end, the new CR-V's still-practical package is now wrapped in a more fashion-forward design. The side view is dramatically different, with an elliptically shaped greenhouse. Up front, the slash-cut headlamps point the way towards a laid-back windshield. Meanwhile, it's addition by subtraction in back. The rear view improves thanks to the deletion of the former bumper-mounted spare tire carrier. The CR-V is now offered in three trim levels: LX, EX, and EX-L. A tire pressure monitoring system is newly standard across the board, as are 17-inch wheels. The steering column now telescopes as well as tilts. All sound systems have an MP3/auxilliary audio input jack, and speed-sensitive volume control. Those parents not equipped with eyes in the backs of their heads can utilize the standard "conversation mirror" on the back of the sun visor to keep tabs on the rear-seat occupants. LX and EX models have a retractable center tray table between the front seats. It's replaced by a fixed, floor-mounted console on EX-L models. Two covered storage containers are included - the larger of which is big enough to hold 24 CDs. EX and EX-L models gain a folding, removable, dual-level shelf in the cargo bay for added storage options. XM Satellite Radio is standard on the EX-L.
Honda's Real Time four-wheel-drive system is available on all trim levels. A GPS navigation system with a large, six-and-a-half-inch screen, voice recognition and rearview camera function is offered on EX-L models. The navigation system also includes an upgraded audio system, with 270 watts of power, a six-disc, center console CD changer, seven speakers (including subwoofer) and a digital audio card reader. 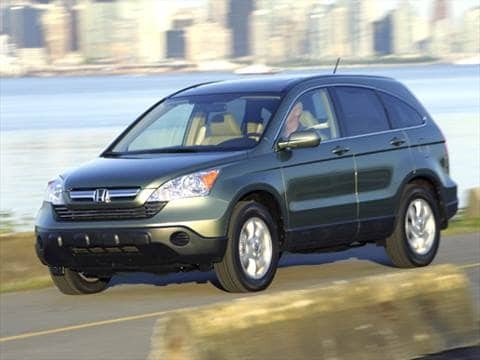 The CR-V's drivetrain has been refined and simplified for 2007. The 2.4-liter four-cylinder engine makes 166 horsepower (10 more than the last generation) and delivers its 161 pound-feet of torque across a wider power band than previously. The four-cylinder engine is linked exclusively to a five-speed automatic transmission. Dropping the five-speed manual transmission - formerly standard equipment on the CR-V - may be lamented by mileage maximizers, but Honda says that the demand for stick-shift CR-Vs among buyers has been low (only three percent) and dropping. Prices for two-wheel-drive CR-V models start at $21,195 for the base LX, then go to $23,445 for the EX trim level, $25,395 for EX-L and $27,395 for an EX-L with navigation system. On four-wheel-drive models sticker prices begin at $22,395 for an LX, $24,645 for an EX, $26,595 for an EX-L and $28,595 for the EX-L with Navigation. A look at the Fair Purchase Price shows the typical transaction price others are paying for the CR-V in your area, so be sure to check it out before you buy. Among the models cross-shopped with the CR-V are the Toyota RAV4 and the Jeep Compass. The Jeep - a newcomer to this segment - compares favorably with the CR-V on features per dollar, but it lacks the track record for reliability that the Honda enjoys. The latest generation RAV4 and CR-V models are so close comparatively that choosing between them simply comes down to the best price and personal preference. Solid, extremely reliable and good but fun SUV. good stereo sound, comfortable seats, good gas mileage, valve stay the same after 2 year owned-per KBB checked. What a great, reliable and economical car. Nice car rides well. Very reliable but windshield/wiper system and rear seats could use a redo. Other than that is is a great car. Great car, very low mileage, great price.